Quentin Collins returns to the Old House on the Collins estate, empty-handed in several senses of the word. Earlier in the evening, he went to his friend Evan’s house to retrieve the legendary Hand of Count Petofi, a magical artifact that may have the power to release him from a terrible curse. But he returns without it, and his gypsy friend Magda is crushed. She was the one who put the terrible curse on him in the first place, but they’ve made peace with each other, and now they’re bonded together in a way that only two people who wear too much makeup can be. 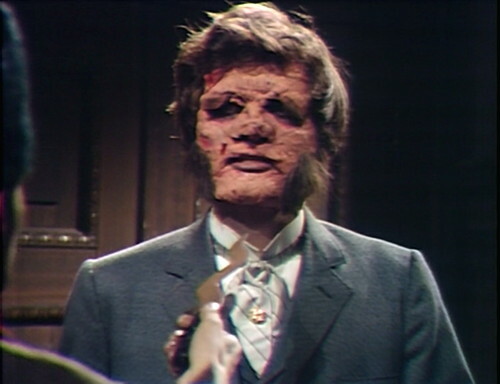 Quentin is currently acting his way through a horribly scarred and twisted latex face mask, which was affixed to his face by the legendary Hand of guess who. This makes him absolutely unrecognizable to his friends and family, even from behind, despite the fact that his hair and clothes and stature and voice are exactly the same, plus there honestly aren’t that many people on the show these days. This is basically the same problem that they have in Metropolis, a city where people just don’t look at each other very hard. Naturally, this situation is intolerable, and must be corrected. 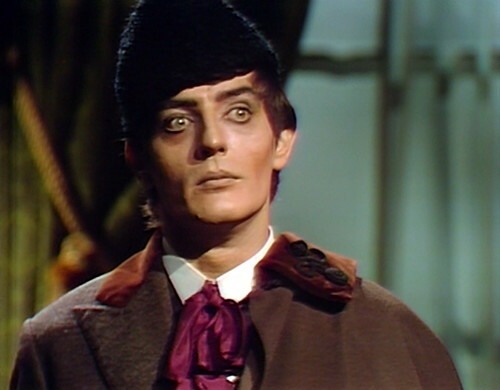 Looking at Quentin’s face has become an important part of the Dark Shadows viewing experience. Somebody is going to have to take care of this. So Magda is crushed when she learns that Quentin doesn’t have the Hand. He tells her that he had it, but a stranger came in and took it away from him. She assumes that it must have been someone sent by the gypsies, but then Quentin mentions that it was a young man, which confounds Magda. “That doesn’t make no sense!” she cries, and she’s not wrong. Quentin’s own family can’t recognize him under all that mess on his face, but this perfect stranger suddenly knows who he is, what he’s holding, and how long he’s going to keep it. He’s terribly well-informed for somebody who just walked onto the set; they must have a super-efficient onboarding process. His name is Aristede, and he’s something that we’ve never seen before, a true exotic. Dark Shadows is firmly committed to surprising the audience on a regular basis, but ethnicity-wise, it mostly runs the gamut from one hair color to another. And then in walks Aristede, a visitor from another world. Aristede is played by Michael Stroka, and I’ve been trying to figure out his ethnicity, by which I mean I’ve done a bunch of Google searches and turned up very little. He was born in Passaic, New Jersey, which I’m sure was very nice but doesn’t help me very much, and according to his Wikipedia page, his parents are from Slovakia, which ditto. The thing I’m trying to figure out is how much brown makeup they’re using on the guy — whether he’s actually a noticeably different ethnicity from the rest of the cast, or if Vinnie Loscalzo in makeup is giving him the Magda Rakosi shoe polish special. They’ve gone to some length to make Aristede look different and exciting, and as far as I’m concerned, it’s a complete success. There’s the hat and the cape, obviously, and the eye makeup — and then there’s the knife. And yeah, she is beautiful; she’s exactly the kind of eye-catching prop that Aristede needs, in order to graduate from intuder to spectacle. In time, you may forget this particular plot point — where they’re standing, whether Quentin’s face was normal or ugly, who else was in the room — but you will not forget the Dancing Girl. The guy may be from Slovakia by way of Passaic, and the hat from Afghanistan, but the Persian swordsmith’s twisty dagger takes us directly into the Arabian Nights. It’s the farthest that we’ve ever traveled; this is a show where the Egyptian fire worshipper is blonde, and the gypsy caravan is parked outside Boston. Dark Shadows has never gone this far outside their corridor before. That’s important — not just because it’s thrilling, but also because it softens the rough edges of a story point appearing from more or less nowhere. And I believe that’s all the explanation we’re going to get on this. Somehow, Aristede knew exactly where he would find the Hand, and who would be holding it, probably thanks to a djinn he summoned by rubbing the Ralston-Purina lamp. His magic carpet must be double-parked outside. Quentin asks, “Why do you need the Hand?” which is on the list of Things You Shouldn’t Ask People with Knives. Not at the top of the list, but it’s on there somewhere. That’s the second time Aristede has assured Quentin that he doesn’t wish him any harm, which is intriguing, and we also get another example of his uncanny understanding of the situation he’s interrupting. A moment later, he gets a chance to prove that he doesn’t want unnecessary bloodshed. Quentin tries to grab Aristede’s wrist and get away, but it’s no use; the Dancing Girl flashes, and Quentin is pinned against the desk, the blade right up against his jugular. Collecting the box, the stranger backs out of the room. “Delighted to have met you, Mr. Collins,” he grins. “So sorry we won’t be meeting again.” And with a satisied chuckle, he exits, disappearing into the darkness and closing the door behind him. And then he’s gone, well aware of the terrible mess he’s left behind and entirely unbothered about it. Quentin’s plans are upended again, this time by a flicker of a different story — from another world, and another time — that has suddenly materialized on our stage. Aristede isn’t just a new person joining the Dark Shadows menagerie. He’s a new kind of person, and who knows what might follow in his wake. When we see Evan lying on the floor in acts 1 and 2, there’s yellow blocking tape on the rug next to him. I edited for clarity above, but what Quentin really says is, “How did you know me? How did you find me?” and Aristede’s response is, “It’s my business to find what I need, and to get what I need!” I don’t know if those lines were written that way, but I doubt it. Aristede was Michael Stroka’s first big television role. He had small parts in a couple movies — 36 Hours in 1964 and King Rat in 1965, plus a couple episodes of Combat! 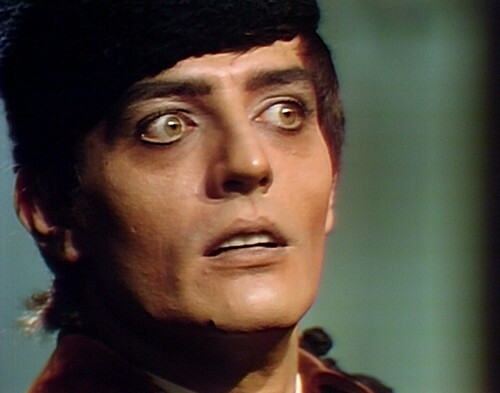 The usually unimpeachable Barnabas & Company says that Stroka also had an uncredited role in an episode of The Twilight Zone, but there are a couple forum threads about him on Twilight Zone websites, and nobody can confirm which episode, or if he was on the show at all. Stroka came to Dan Curtis’ attention in fall 1968, when he auditioned for the role of a psychic investigator on Curtis’ primetime pilot, Dead of Night. We’ll hear more about that project in a month or so. 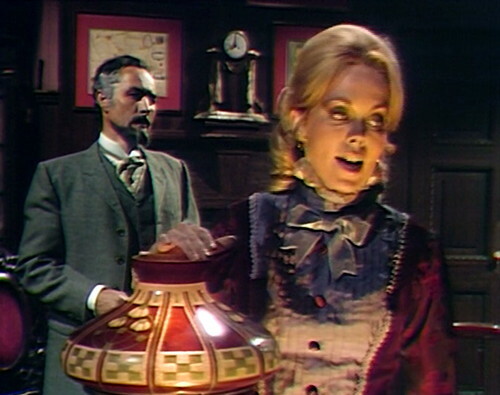 In today’s post, I mentioned my favorite prop, the Ralston-Purina lamp, which is actually there at Evan’s place today. It wasn’t there yesterday, but it pops up today and gets quite a lot of screen time. In act 2, Angelique fondles it for a minute, potentially summoning more mercurial djinns. We last saw the lamp a few weeks ago, in Judith’s room in Collinwood. Also, Barnabas’ toy soldier makes an appearance today, after a long absence. I can’t remember the last time we saw it. It’s been ages. Wielder of the Dancing Girl! 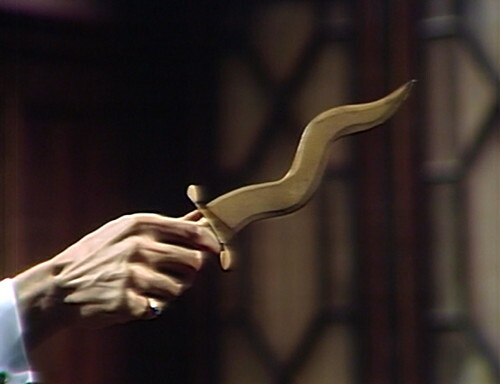 Or…..that creepy old magic hand! Aristede was definitely hot. A little vibe there with Quentin. Well, if Joan Bennett, and consequently Judith, is going to be off the show for a while, they may as well move the Ralston-Purina lamp to other sets, because it’s just too good a prop to be put into storage until Bennett gets back. I recently acquired the full DVD set of Twilight Zone, so I’ll keep a lookout for Stroka. Michael Stroka is so convincing as the sadistic Aristede that it was a shock when the actor turned up on “The Edge of Night” in the mid-70s playing a caring psychiatrist named – I kid you not – Quentin. He was on for about 18 months and was killed off by a mob assassin looking for information on one of his patients. It was an insanely great mystery story. I couldn’t agree more that The Edge of Night presented insanely great mystery stories. I think the writers of Dark Shadows could have learned something from the head writer of Edge (at the time), Henry Slesar. Oh, yeah, Robert. No one compares to Henry Slesar. That man crafted the most devious stories in the genre. Really an unrated genius. He was the master of long-range planning – 18 months or more in advance – while DS was lucky to get though an episode. What I absolutely LOVED about “Edge of Night” was that they would have a huge mystery, they would set you up to think the mystery was solved, and there was always a monkey wrench – the solution that they led you to believe was not it – it was always something else, and then there was always another big dramatic reveal for the real solution to the mystery that no one could have possibly seen coming. It was the best written soap on the air, and Henry Slesar really knew how to put together a good story. “Edge” was one of the few soaps extremely popular among males. On second thought, it’s an unlikely long shot that Michael Stroka appeared on any episodes of Twilight Zone. On reading up on his background, it is written that Stroka was graduating from Carnegie Institute of Technology in Pittsburgh in 1964 when Twilight Zone was just finishing up its series run that spring. On top of that, Twilight Zone was filmed from CBS Television City in Los Angeles. 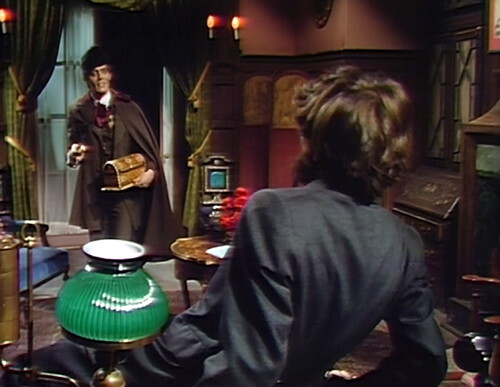 Perhaps a Dark Shadows fan saw an extra on the show that, in retrospect, resembled Stroka and posted it on the Internet some years ago, and the erroneous information has been perpetuated ever since. Even the biography section of Stroka’s IMDb claims that he appeared in three Twilight Zone episodes. But that same paragraph states that “Michael attended the Carnegie Institute of Technology, then moved to California…” First he found work on stage, then in films… Oh, I see also that the IMDb bio page was done by Craig Hamrick, author of Barnabas & Company. The filmography of Stroka’s IMDb page, which was not written by a Dark Shadows author, makes no mention of Twilight Zone. 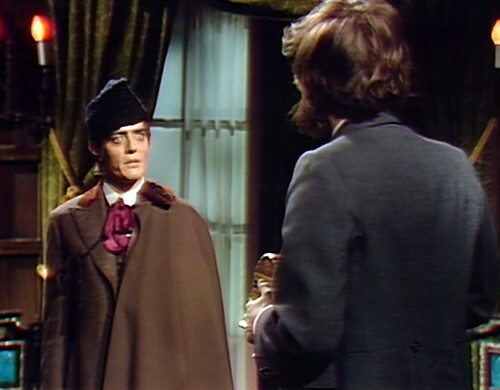 So we can only assume that Stroka did not appear on Twilight Zone, but that certain fans of Dark Shadows think that he might have, based on one unsubstantiated claim posted on a Dark Shadows fan site, probably in the early days of the Internet. I mean, why didn’t Stroka himself ever mention it? If you were on three episodes of Twilight Zone, wouldn’t you, at some point in your career, list that on your resume? 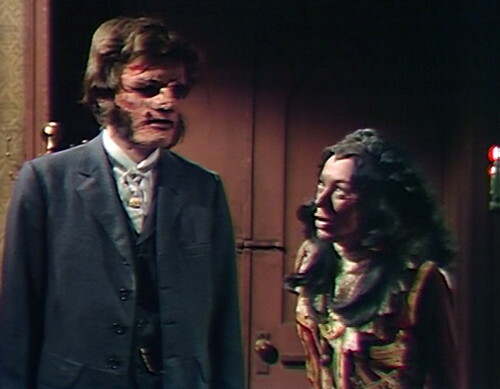 Aristede had the best laugh on Dark Shadows. It always sounded natural, never forced. He also had a twinkle in his eye when he was about to do something particularly dastardly. Just watched this again and I wonder how Lara Parker did the costume change from her scene in the Old House to her meeting Aristede on the docks. There’s enough time for her to dart over to the latter set during the close-up on Stroka, but she’s wearing an entirely different outfit. I almost wonder if that scene was filmed separately (as she never wears the dress again) but that otherwise doesn’t jibe with the ‘live on tape” production. It seems like it was at this point that Lara Parker began to relish her role. Lara does one of her best scenes, albeit subtly, when she appears in Evan Hanley’s place. We thought she would come to Quentin, but instead, it gave her the idea of how to get back in the fold, as she explains in an adorable way to Hanley. Factoid… I have the original script for episode 808, and Aristede is spelled throughout as Aristide.